Doesn’t this totally remind you of the rap battle from 8 Mile? No? The amazing beatboxer Kid Beyond (who I first heard at w00tstock back in the fall) did a damn good job going up against Jonathan Coulton and his ZenDrum, but in the end I’ve gotta give it to JoCo. I’m a sucker for Beyoncé. The rest of the show, by the way, was also great. Although, Paul and Storm let me down a little, with only a 12 minute long version of The Captain’s Wife’s Lament. 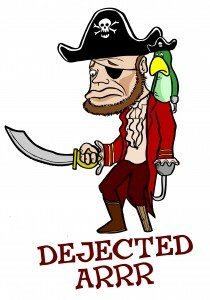 DEJECTED ARRR!!! My friend Rob sent me this video, which I had somehow missed when it came out this summer. I agree with the points that Daniel Floyd and Leigh Alexander make, especially how browser-based and casual titles can lead to regular console gaming (I’ve long called The Sims a “gateway drug game”). What I really liked was how some game companies, like Ubisoft, are creating games that “appeal to a younger generation of girls,” in effect planting the seeds for them to grow up with a love for games. Applications are now being accepted for the 2010 G.I.R.L. Scholarship to help educate and recruit more women into the field of video game production and design. Sponsored by Sony Online Entertainment LLC (SOE) a global leader in online gaming, and administered by Scholarship America®, a leading non-profit educational support program, applications are available at https://www.scholarshipamerica.org/gamersinreallife and more details, including official rules for entry are also available online at http://www.station.sony.com/girl/. If you know a girl who may be interested, please pass thing along! It seems like a really great opportunity to encourage more women to become involved in this industry. Tomorrow morning I’ll be heading back to Las Vegas for CES, and I’m really curious to see what kind of year it’s going to turn out to be. CES is being bookended by the Google press event that happened today announcing the Nexus One, and the supposed Apple event that could be happening at the end of the month. As I said on TWiT this past week, I’m not really that interested in an Apple tablet, though I’m sure whatever they release will be (at the very least) interesting. So what do we have to look forward in the meantime? Lots of netbooks, 4G and WiMax talk, new Intel processors, eco-friendly gadgets and lots of web-enabled TVs. Yeah, so basically a lot like last year. I’ll be helping Tekzilla cover the show, of course (follow the Revision3 CES Twitter list here), but I’ll also be paying special attention to any gaming-related content on the show floor for Qore as well. That means you’ll probably see me floating around the Sony booth quite a bit. Plus, I’ll be guest-hosting Buzz Out Loud on Friday morning at 9AM PST, so if you’re around the South Hall come check it out (or listen online). Let me know what you’re most excited about seeing at the show this year in the comments, and don’t forget to add your most coveted gadgets to your lists on gdgt! Last week on BuzzFeed, a meme popped up about a man named Jim Donnelly. 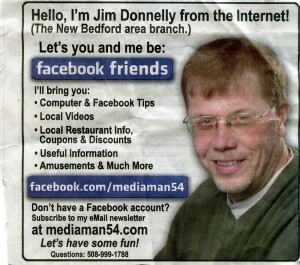 Jim attracted attention for running an advertisement in his local newspaper in New Bedford, MA, in which he asks people to become his friend on Facebook (to learn, among other things, “Useful Information”). The internet, being what it is, reacted to the this unusual proposition in its typical manner. Heck, I even added a “WTF” badge to the comments thread. After reading the story, I decided to post it to my Facebook page. After all, it’s not every day someone promotes their Facebook account via newspaper. Lo and behold, Jim paid me a visit in the comments, and so I decided to ask him a few questions to learn more about why he decided to reach out to people in this particular manner, and how the attention this week has been. The interview (and his extensive answers) are after the jump. cesar cienfuegos: Thanks for the interview, Veronica.